Falsely condemned as a terrorist by political leaders, Abdellatif, his wife and six children have been held in detention for more than three years without charge. 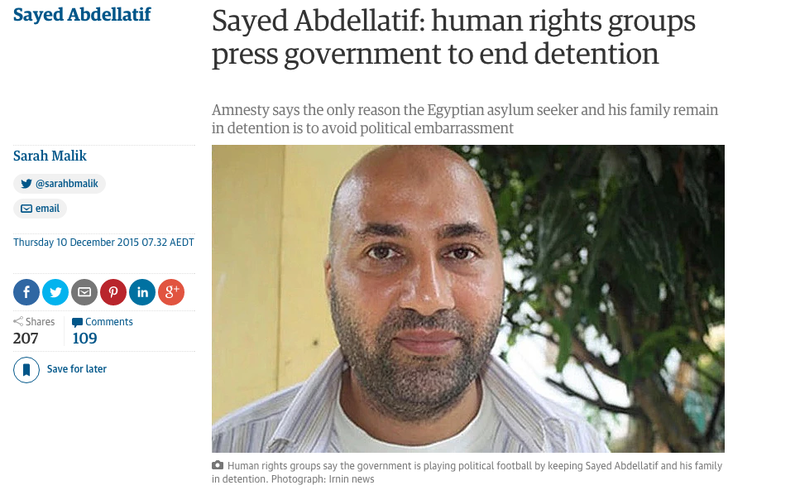 Human rights groups have condemned the continued incarceration of Egyptian asylum seeker Sayed Abdellatif after a Guardian Australia investigation revealed the United Nations had formally told the Australian government he should be immediately released. In the first of a three-part series, the Guardian on Monday revealed the UN Human Rights Council in June ruled Abdellatif’s detention breached international law, was indefinite and arbitrary, and directed Australia to release him and compensate him for his wrongful detention. The series also revealed the struggles of Abdellatif’s two eldest daughters, the first students to graduate from high school while incarcerated at Sydney’s Villawood detention centre, as well as detailing the torture inflicted on Abdellatif by Egypt’s State Security Investigation Service (SSI) under former dictator Hosni Mubarak, which forced him to flee his homeland in 1992. Amnesty refugee campaigns spokesman Graeme McGregor said government intransigence around Abdellatif’s case was a result of the negative publicity the story had generated. “It’s outrageous that these children are being denied the opportunity to have a normal adolescence with their father,” he said. “It’s hard not to believe the only reason Mr Abdellatif is trapped in detention is because of the political embarrassment that surrounds the case. The vice-president of the Muslim Legal Network, Rabea Khan, also criticised the family’s continued detention despite an assessment from the inspector-general of intelligence and security that made clear Abdellatif poses no threat to Australia’s national security. The inspector-general also criticised the government’s handling of Abdellatif’s case. “It’s disturbing that the Australian government continues to sit on its hands instead of going ahead and releasing this man from detention,” Khan said. In 1999, seven years after he left Egypt, Abdellatif was convicted in absentia in a mass show trial of 107 men in Cairo. The trial was condemned as unfair byAmnesty and Human Rights Watch. It has also since been discredited in his home country as a politically motivated suppression of Islamic political opposition. A 2013 Guardian Australia investigation into the trial uncovered further serious irregularities, resulting in Interpol dropping all convictions for violence in a red notice against him. The Abdellatif family has been found by Australia to have a prima facie claim to refugee status. Australia is obliged under international law to offer them protection. Refugee Action Coalition spokesman Ian Rintoul said Australian authorities had used the red notice as an excuse for not processing Abdellatif. “All the evidence points that the red notice was placed there wrongly by the Egyptian government as a politically motivated [tool] to victimise Sayed,” Rintoul said. Rintoul said all the evidence showed the family should not be in detention. “The degree the government has caused Sayed and his family to suffer cannot be overstated,” he said. Human Rights Law Centre legal advocacy director Daniel Webb said Australia’s detention regime made detaining people a first resort, and vested extraordinary powers over people’s lives in the position of immigration minister. “Giving relatively unchecked powers over peoples’ basic rights to one politician is a recipe for injustice,” he said. The government has maintained a resolute silence on Abdellatif’s case, despite being offered several opportunities to comment. Guardian Australia has repeatedly approached the government for a response. For the latest series, Guardian Australia first provided written questions to the immigration department on 22 October. After initially agreeing to provide answers by 30 October, a department spokesman has since refused to answer any questions and directed all queries to the office of the minister, Peter Dutton. Dutton’s office has not responded to any inquiries.